Dutch company Barge Master has developed a wave compensation technology for use on existing barges and vessels that aims to solve the age-old problem of sea motion affecting marine activities during offshore wind farm construction. The Barge Master system in essence is composed of a triangular platform on which a crane with supply load can be placed. Three hydraulic cylinders are used to compensate the vessel’s movements in a vertical direction and its rotations across the length and cross axes. In addition, three constraining rods keep the platform fixed to the vessel in the horizontal plane. The massive hydraulic cylinders feature a stroke of 2.5 meters; the installed nominal system power is 1.5MW. Earlier this year the technology start-up successfully completed a series of North Sea tests with the initial BM-001 Barge Master motion compensation platform. The company tested this platform by compensating a 700-tonne load: the trial set-up comprised a 250-tonne crane and a supply load being delivered to a jack-up barge. The first commercial Barge Master deployment is expected later this year. 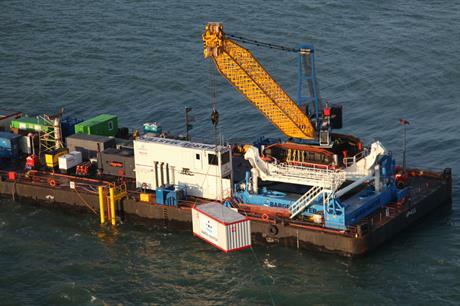 Offshore wind farm construction takes place under demanding marine conditions. Vessel type and weather-related factors such as wave height and wind speed all have a huge impact on how many hours can be worked. Turbine installation is often seen as the most critical wind farm construction phase. The installation process usually commences with placing the tower and nacelle on top of a pre-installed foundation. The next step involves rotor and blades assembly, and with common three-bladed rotors the installation process often involves single-piece blade mounting. Each of these activities requires crane deployment. Relatively small installation barge/vessel rotations in the 2-3 degree range typically translate into movements of crane boom tip, hook and supply load of up to 4-5 metres. Substantial crane boom movements during rough weather conditions can greatly compromise the accuracy that is crucial during the positioning and placement of main components. "Wave motion causes a barge or vessel to move, whereby stability of the crane could be lost and introduce a dangerous swinging of the crane hook load," explains Martijn Koppert, inventor and co-founder of Barge Master. The most dangerous situation, he adds, occurs when even a small movement of the crane boom tip introduces a pendulum effect. This manifests itself by a wide arc-type movement, and this, in turn, could cause a load to swing across the deck with substantial risk of workers getting hurt. "Such unsafe working conditions could also force putting all ongoing offshore operations on hold," Koppert points out, "which causes delays in project progress as well as adding to overall project costs." Barge/vessel movements can be described in six degrees of freedom that need to be compensated to prevent a platform from moving, explains Koppert: "A dynamic positioning system or more commonly used traditional anchors are employed for nearly eliminating three of these six degrees of freedom." The remaining three include one translation (heave) and two rotations (roll and pitch). "These are compensated by Barge Master’s platform," Koppert adds, "which is dynamically controlled by three hydraulic actuators." The Barge Master’s control system continuously measures heave, roll and pitch values reused as dynamic inputs for the platform’s actuators responsible for counteractive motion control. This high-tech solution enables a "fixed" stable platform position. Full-scale tests in the North Sea have shown compensation percentages upward of 95%, according to Koppert. Standard barges and cranes are widely available. A Barge Master system only requires mobilising for creating a motion-compensated crane barge. Since the entire system is fully containerised, mobilisation costs can be minimised. "Essentially, a Barge Master can be placed on any vessel or barge deck, while custom built systems are in development," Koppert concludes.